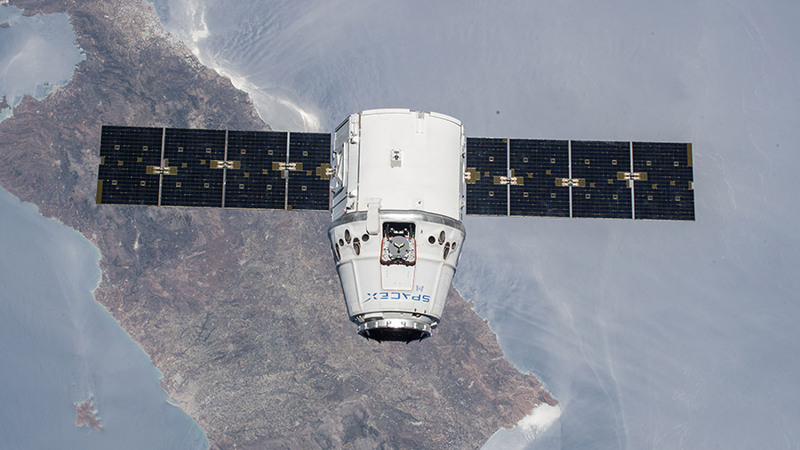 The SpaceX Dragon cargo craft is pictured in July of 2018 approaching the International Space Station as both spacecraft were orbiting over the Greek island of Crete. A Dragon is chasing the International Space Station today to be gracefully captured by a robotic arm early Saturday. The expanded Expedition 57 crew prepared for Dragon’s arrival while conducting science, spacesuit checks and a variety of other station activities. The SpaceX Dragon cargo craft has been orbiting Earth for one day now carrying over 5,600 pounds of science, supplies and hardware for the crew. It is due to arrive Saturday around 6 a.m. when astronauts Alexander Gerst and Serena Auñón-Chancellor will command the Canadarm2 to grapple Dragon. The duo along with new Flight Engineer Anne McClain trained today for Dragon’s approach and rendezvous. Gerst later worked on U.S. spacesuit maintenance cleaning their cooling loops. Serena worked on a cement study inside the orbital lab that could inform the construction of future lunar or Martian habitats. McClain is getting used to her new home in space with fellow Flight Engineers Oleg Kononenko and David Saint-Jacques who have been onboard the station since Monday. This is Kononenko’s fourth stint at the station and he is unpacking the Soyuz MS-11 spacecraft that launched him and his crew to space. McClain and Saint-Jacques are first-time space residents and they worked on a visual perception and orientation study today. The duo also packed up biology research gear that will be stowed in Dragon for return to Earth after it arrives on Saturday. Kononenko also joined Flight Engineer Sergey Prokopyev to ready a pair of Russian Orlan spacesuits for a spacewalk on Dec. 11. The duo will inspect the Soyuz MS-09 crew ship that will return Prokopyev, Gerst and Serena back to Earth Dec. 19 U.S. time.